You can move the mouse on the part of the interface to play the file in process, there will be a “floating control bar” through “floating control bar. ” Easily switch between the various modes, you can also click on the menu in the corresponding menu item to switch and can also be switched via hotkeys. Hotkey information for the QQ Player can be found in Use and Set Hotkeys. Right Click on the main menu displayed under [-] on top, pop-up submenu , select the appropriate item. You can make the QQ Player window be in the forefront, when playing in the front or not the. 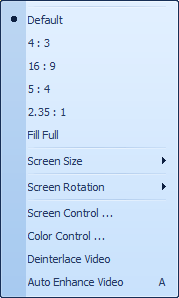 Right Click on the main menu under [Screen Control], pop-up submenu , select the appropriate item. You can make the QQ Player playback video display by a certain percentage or as covered windows.